It’s one of the year’s best meteor showers, and it peaks tonight. In fact, the 2016 Perseid meteor shower promises to be one of the most active in recent memory, should skies remain clear. The Persids are the result of Earth passing through the trail of Comet Swift-Tuttle, sending debris streaking across the heavens. 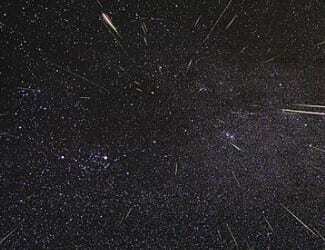 Officials at NASA say that a Perseid outburst may take place, producing double the normal meteor rates, around 200 meteors per hour, on the night of August 11 into the wee hours of August 12. For best results, head outside after midnight (after the moon sets). In fact, the best viewing times will be between 1 a.m. and 5 a.m. on August 12th and between 2 a.m. and 5 a.m. on August 13th. They Perseid meteor shower typically radiates from the northeast. The meteors tend to streak upward before midnight, and streak sideways across the sky after that. “For 2016, the next super-shower is the Geminids, but the moon will unfortunately be near full and will interfere,” according to Berman.